ICANN's preparations for the launch of New Top Level Domains are in progress. The Sunrise Period of the Shopping-Domains starts 19th July 2016. 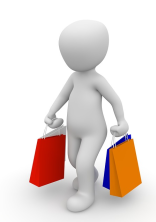 The Shopping-Domain is the domain of first choice for all websites concerning shopping. Here you can pre-register your name among the most important New Top Level Domains like the Shopping-domain. Pre-registration is free, but binding. The standard Shopping-Domain will cost 60 US-Dollar/year. You have to add 150 US-Dollar application fee at the Sunrise Period.